The U5751 & U5752 has a hardwood base that features a slot for business cards. Stained mahogany finish. Aluminum name plate fastened into place with two-sided tape after sublimation. 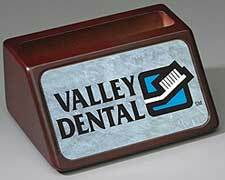 Unisub Aluminum Insert - Rounded Corners 2"x3.5"
Unisub Business Card Holder w/ Insert - Mahogany - 4"x1.625"
Unisub Executive Desk Name Plate - 9.49"x1.68"